OK, so it's been very hot for the past four weeks, but I've begun to think about Fall. I love Summer but I do enjoy the cooler weather when I can open the windows and let the breeze blow through. In fact, the thought of Fall inspired this card. The More Mustard color reminds me of fall leaves. 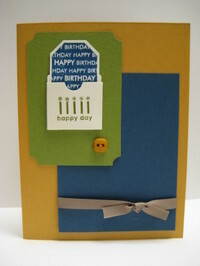 I used this for the card base and then added a piece of Not Quite Navy card stock on the right side. A piece of Old Olive card stock was punched with the ticket corner punch and attached to the right side. A small pocket was created using the library pocket punch by Marvy Uchida. The candle image was inked with Old Olive and the tag image was inked with Not Quite Navy and punched with the SU small tag punch. I attached a small button using gold cord and finished the design with a piece of cocoa ribbon. 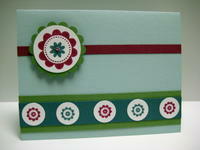 All card stock, ink, stamps and embellishments are @Stampin' Up. Cooler weather, here we come. I love these two stamp sets...Big Flowers and Little Flowers. They're just adorable. 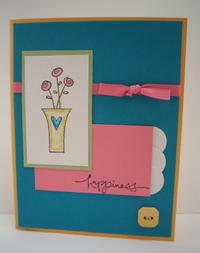 I stamped one of the Big Flowers with Purely Pomegranite and then stamped it again with Buckaroo Blue. I punched out the center of the one stamped in Buckaroo Blue and layered it on top of the other one. I punched a piece of Wild Wasabi using the new scallop punch and layered the stamped image on the top and then used dimensionsals to attach it to the card over a small strip of Purely Pomegranite. A strip of Wild Wasabi and a smaller strip of Buckaroo Blue were added to the bottom and then one of the images from Small Flowers was inked alternatively with Purely Pomegranite and Buckaroo Blue and layered on top of the strips. It's somewhat difficult to see in the pictures but a small dot of Dazzling Diamonds enhances the center of both the large and small flower images. All card stock, ink, stamps and accessories are @Stampin' Up. This was one of the first pictures I took with the new camera. I really like how it turned out. We're flying to Seattle tomorrow. We're going to spend three days in Seattle and then drive down to Portland and spend three days there. I've never been to either place and I'm really looking forward to it. I get to add two more states to my list...hee hee hee. There are two stamp stores that I'm planning to visit in Seattle as well as several microbreweries that are calling my name. Some of our other planned activities include visiting the Space Needle, Pike Place Market, attending a Mariners game, whale watching on a beach on the Oregon coast, visiting Mount Hood and at least one Oregon winery. I have a few posts that are set appear while I'm gone so be sure to check back throughout the week. The house/kitty sitter is ready, the bags are packed and I should go get some sleep now. Woohoo! I can now download pictures from my camera. It helps to read the instructions...hee hee hee. I do have quite a few cards that I need to photograph, however, I don't really have time to do it right now. I belong to a monthly Bunko group and August is my month to host. It's tomorrow night so I have to make sure everything is ready. Greta always enjoys showing off for everyone. I think that she thinks she's just one of the girls...hee hee hee. She's such a cutie. The only Stampin' Up' item I don't love is the watercolor pencils. The greens are hideous and they don't match anything! I decided to buy a set of Prismacolor pencils and I'm so glad I did. They match many of the SU colors and they are so easy to use. I use Gamsol to blend the color. I'm not an artist, but these pencils make it so easy to watercolor like a pro. All images, card stock, ink and accessories are @ Stampin' Up. I'm having a hard time downloading pictures from my new camera. I guess I need to play with it some more. For some reason, my computer isn't recognizing the camera...ugh! Technology...grrrrrrr. Now that the Muny season has ended, we've gone back to our Friday night tradition of visiting new restaurants. Tonight we ate at Guido's Pizzeria and Tapas. The restaurant is owned by Miguel, Segundo and Genoveva Carreteros who are natives of Madrid, Spain. They wanted to open a restaurant featuring recipes from their homeland, thus Guido's was born. We had the Manchego cheese and olives, serrano ham, and spanish meatballs. Bill had the calamari and I had the egg and potato dish called Tortillas Espanola. There were still a few dishes that I wanted to try, however, I was much too full so they'll have to wait until next time. After dinner, we stopped by Bottleworks for a piece of their sticky toffee pudding and a stout. Yummo. I bought a new camera on Monday. It's a Canon digital Elph. I haven't had much time to play with it and I haven't installed the software so I can't download any pictures yet. I'm hoping to be able to have some time tomorrow night to really start playing with it. I started applying Bella & Birch on the one wall in our family room. This stuff is amazing! It's so easy to use and it looks great. The color we chose is called Blue Bell which is from the Play Collection. As I mentioned in one of my previous posts, it's only available in the St. Louis area. We get to be the test market for it! I wonder why they chose St. Louis? Oh well, who knows. I'm just glad they did. I'll be sure to take a picture of it and post it here soon. Gina K has created a wonderful stamp set called Make A Wish. $7 of each set sold is being donated to the Make a Wish foundation. Click here to see the details for this wonderful cause. I've also added a link to her blog under my "Favorite Blogs." I placed my order today. It's for a great cause and besides, one can never have too many stamp sets...hee hee hee. We went to the Cardinals/Dodgers game today and wow, was it hot! It was 102...quite different from the first game we went to this season when it was 47! Even though our seats were in the shade, we decided to sit at one of the tables at the bar in the Casino Queen Party Porch area. There are ceiling fans and they even had large box fans to help keep everyone cool. We watched the game on the TV screen and occasionally walked over to the open area where we could see the field. Woohoo...the Cards won 12 to 2. After the game, we stopped by Square One for dinner. They have some great seasonals right now, one of which is the Belgian Red. Great brews! The last game we went to was July 8 and, at that time, I thought the next game wasn't until September. I had forgotten that we had tickets for this game. How could I forget about the Dodgers? Hee hee hee. Our next game is September 1. Hopefully it will be at least a little cooler by then.